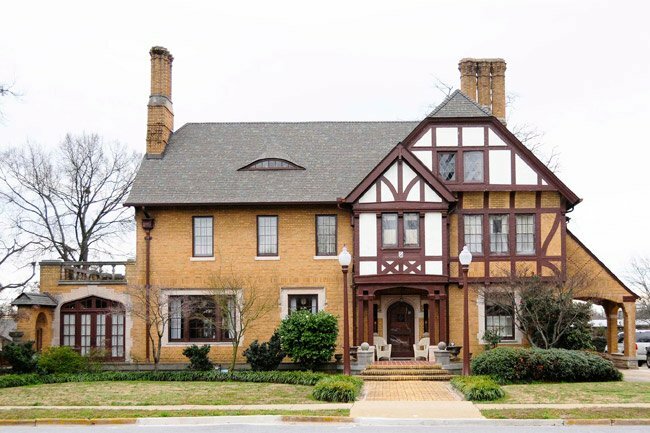 This Tudor-style home in Greer was built in 1921 for Clara Davenport, widow of businessman Malcolm Davenport and daughter-in-law of D.D. Davenport, owner of the Greer Oil Mill Company. The home remained in the Davenport family through much of the twentieth century. The 6,000-suare-foot home sits on two-and-a-half acres and includes a swimming pool, pool house, and three-bay carriage house, also in the Tudor style. The Davenport House, built in 1921, is significant as an outstanding example of a Tudor Revival residence of the period; as an important residential design by prominent Greenville architects James Douthit Beacham and Leon LeGrand; and also for its association with the Davenport family of Greer, one of the city’s most prominent twentieth century business families. The house features a dominant cross gable, steeply pitched roof, and abundant half-timbering which places this residence well within the Tudor Revival style. The expansive 6,000 square foot plan rests on a poured concrete foundation. The mass of the house is dominated by a two-story rectilinear block, interrupted by a front and rear projecting double height cross gable and a third shedded volume that joins with the rear projection. The roof is largely lateral in orientation, but is complicated by the intersection of three cross gables and two sheds. The exterior is comprised of cast stone, hand-made yellow brick, and stucco. These three materials are demarcated by a structure of dark brown heavy oak half-timbering. The base of the house is formed by several courses of rough-surfaced cast stone terminated by a water table at the first floor level. The three-bay coach house and pool house, of matching stucco and timber finish, stand at the side and rear to the main house. The landscaped property also features an encircling yellow brick and heavy timber fence, complete with elaborately detailed and slate roofed entrances to the garden. Hello, this is a private residence currently. It may potentially be open during historical tours of the area that are put on from time to time. Are tours of the house available? Or does someone live there? I delivered the Greenvile News to that house from 1964 to 1968.